7th July, Kaohsiung: 2018 PBA-WBT Busan Cup champion, Annop Arromsaranon of Thailand captured his second title with easy victory in the Men's Open Masters final of the 18th Kaohsiung International Open while Julia Lam of Macau claimed the Ladies' Open crown. 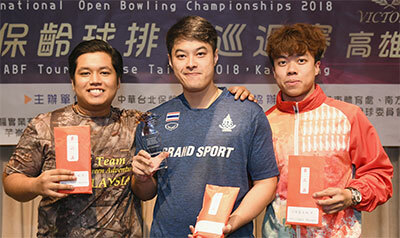 The topseed started off the title match with three strikes-in-a-row to open up a gap of 48 pins as the Malaysian missed a single-pin spare in the opening frame follwed with two converted spares in the second and third frames. Annop added three more strikes putting the match beyond his opponent. The Thai went on to cruise to a commanding victory, 246-153 to win his second international title since winning his first PBA title in Busan two months ago. Syaffique had earlier earned a crack at the title after edging two Hong Kong nationals, second-seed Mike Chan and winner of the first stepladder match, James Lui, 225-214-218. Lui, who topped yesterday's Round 1 finals, ousted fourth-seed and compatriot, Jimmy Cheung and fifth-seed, Atchariya Cheng, 227-192-201 to move up the ladder. Annop, who picked up the top prize of NT$250,000 (approx. US$8,200), had earlier topped the Round 2 finals with 1915, 115 pins ahead of Chan in second with 1800. Syaffique finished third with 1793 followed by Cheung in fourth with 1786. Cheng and Lui made the cut for the stepladder finals in fifth and sixth positions with 1784 and 1774 respectively. 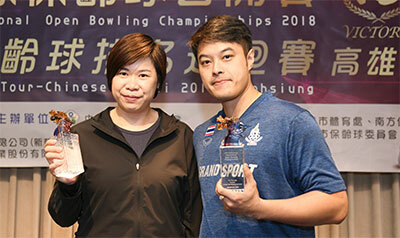 The best Taiwanese finisher was Chen Ming-Tang, who missed the cut by 57 pins in seventh position. Syaffique settled for NT$120,000 as first runner-up with Lui taking home NT$60,000. Chan, Cheng and Chueng earned NT$40,000, NT$35,000 and NT$25,000 in fourth to six positions after the stepladder finals. In the Ladies' Open division, topseed Julia Lam was almost forced into a second decider when failed to spare his ninth frame as her challenger, Lin Shih-Han of Chinese Taipei struck out in her tenth frame. Lam kept her cool to bounced and responded with a double in the tenth and a nine-pin count to edge Lin, 204-195 to win the Ladies' Open title after an eight year drought. Her last title came when she won the 2011 ABF Tour Macau leg. Lin, who was seeded third, dispatched second-seed and Round 1 winner, Chou Chia-Chen and winner of the first match, Lin Yi-Heng, 216-187-193 in an all-Taiwanese second match to face Lam in the finals. Fifth-seed, Lin Yi-Heng eliminated fourth-seed, Wang Yu-Hui and defending champion, Wang Ya-Ting, 183-160-147 in another all-Taiwanese opening match. The champion led from start to finish in the earlier Round 2 finals with 1751. Chou clinched second position with 1606 followed by Lin Shih-Han in third position with 1605. Wang Yu-Hui finished fourth with 1582 while Lin Yi-Heng and Wang secured their spots in the stepladder finals in fifth and sixth positions with 1563 and 1535. Tsai Hsin-Yi missed the cut by 4 pins after finishing in seventh position with 1531. 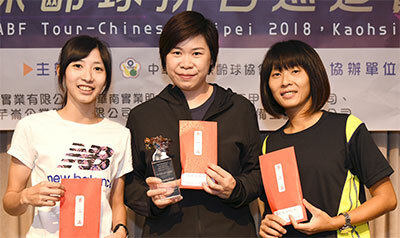 Lam pocketed NT$80,000 as champion with the first and second runners-up taking home NT$40,000 and NT$20,000 a piece. The top 16 men and top 16 women in the preceeding Round 2 finals qualified for the final leg of the 2018 ABF Tour - Chinese Taipei which will be held at the same bowling centre tomorrow. Photos by Terence Yaw in Koahsiung, Chinese Taipei.